The present invention is directed to a method and device for collecting and stabilizing a biological sample, particularly a whole blood sample. 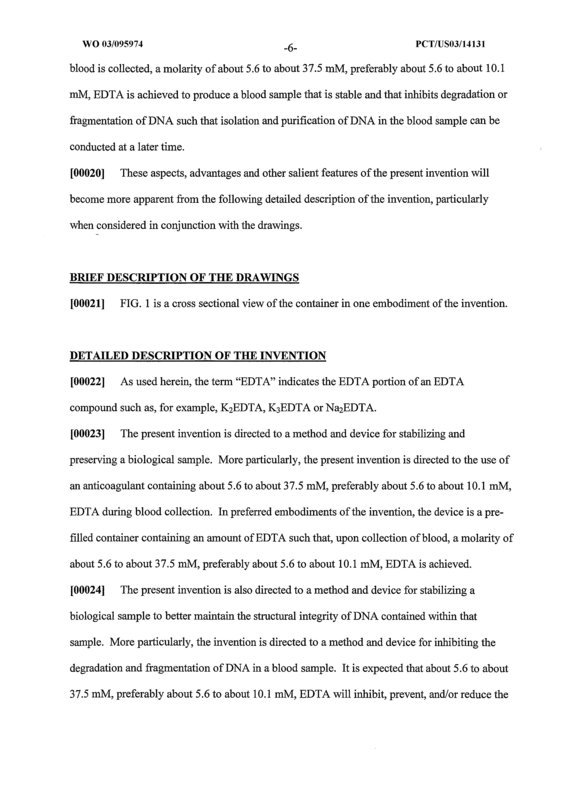 More specifically, the present invention relates to the use of about 5.6 to about 37.5 mM, preferably about 5.6 to about 10.1 mM, EDTA during collection of the sample and to evacuated fluid sample containers having an amount of EDTA contained therein such that, when the sample is collected, the amount achieved is about 5.6 to about 37.5 mM, preferably about 5.6 to about 10.1 mM, EDTA to stabilize the sample. 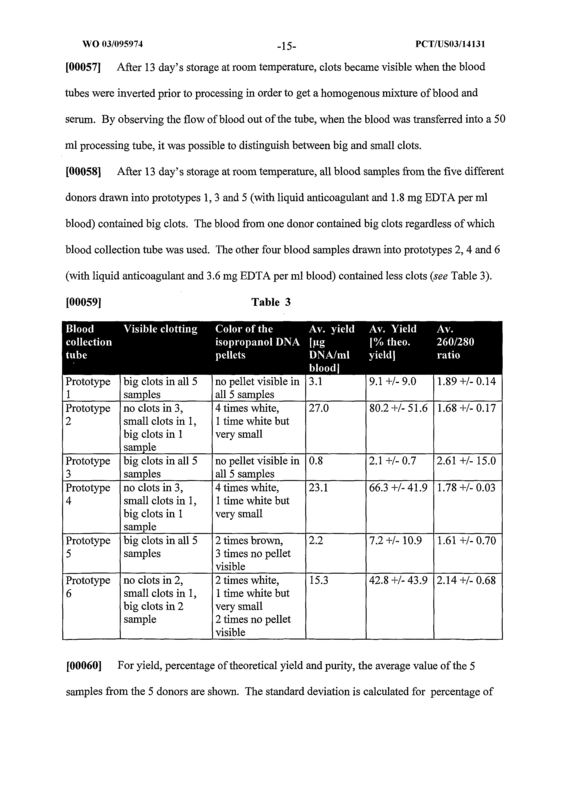 A container for collecting a biological fluid sample, the container having disposed therein an amount of an EDTA compound, wherein upon collection of the sample, a molarity of about 5.6 to about 37.5 mM EDTA is achieved. The container of claim 1, wherein the sample is selected from the group consisting of whole blood, red blood cell concentrates, plasma, serum, urine, bone marrow aspirates, cerebral spinal fluid, tissue cells and other body fluids. 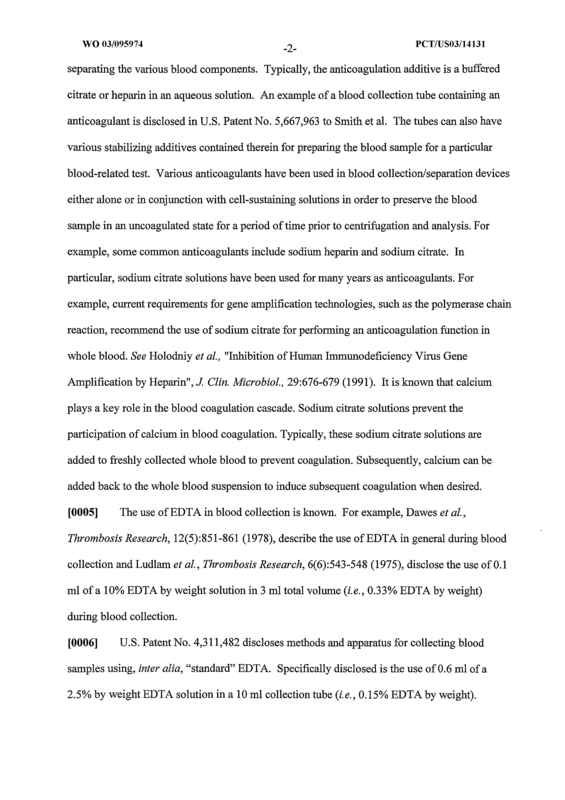 The container of claim 2, wherein the sample is whole blood. 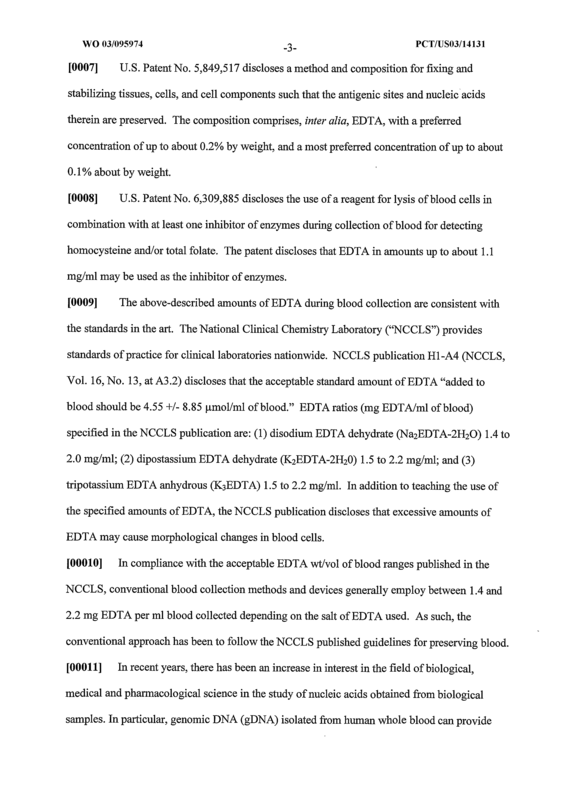 The container of claim 3, wherein the molarity of the EDTA, upon collection of the blood, is about 5.6 to about 10.1 mM. 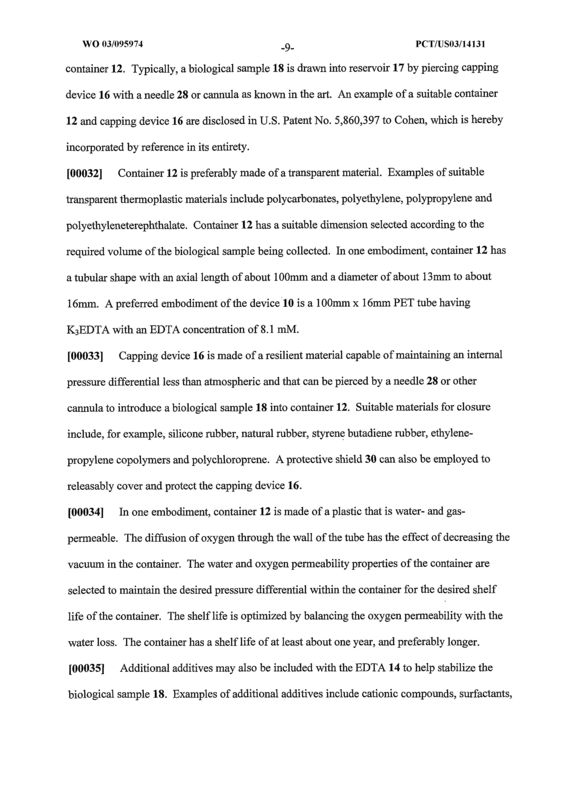 The container of claim 3 , wherein the molarity of the EDTA, upon collection of the blood, is about 6.3 to about 9.0 mM. 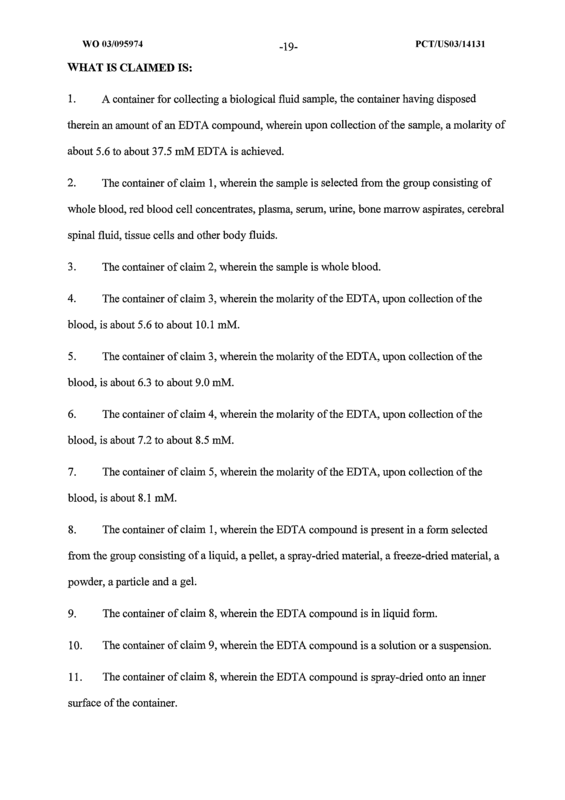 The container of claim 4, wherein the molarity of the EDTA, upon collection of the blood, is about 7.2 to about 8.5 mM. 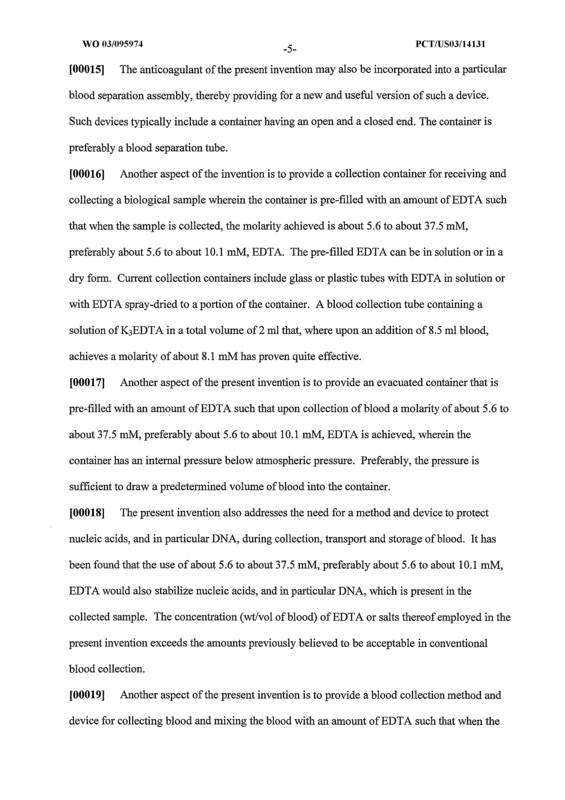 The container of claim 5, wherein the molarity of the EDTA, upon collection of the blood, is about 8.1 mM. The container of claim 1 , wherein the EDTA compound is present in a form selected from the group consisting of a liquid, a pellet, a spray-dried material, a freeze-dried material, a powder, a particle and a gel. 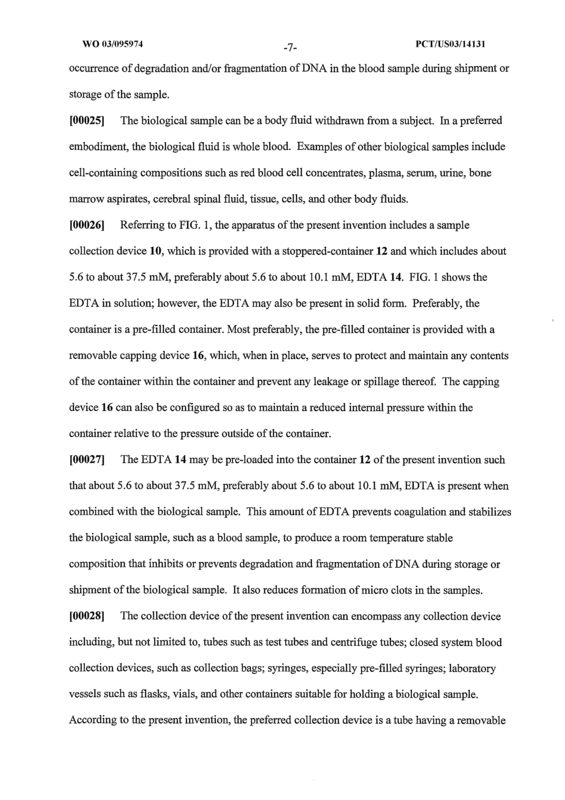 The container of claim 8, wherein the EDTA compound is in liquid form. 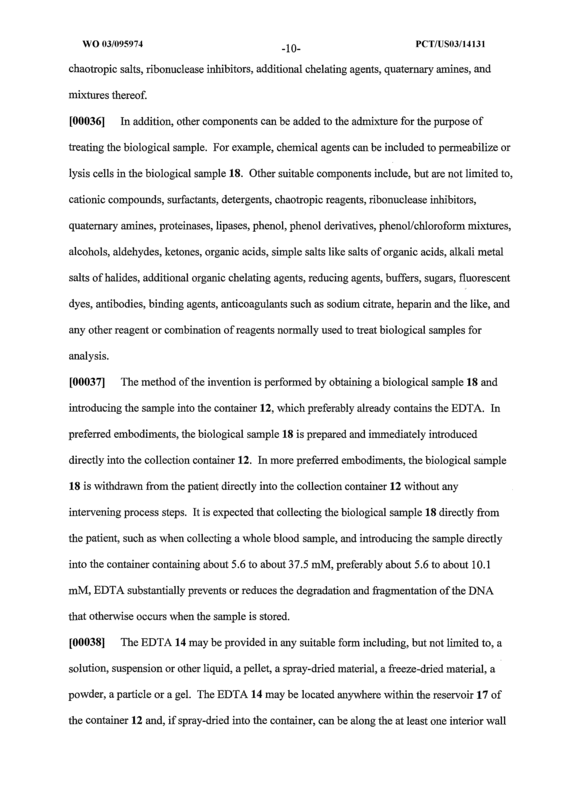 The container of claim 9, wherein the EDTA compound is a solution or a suspension. 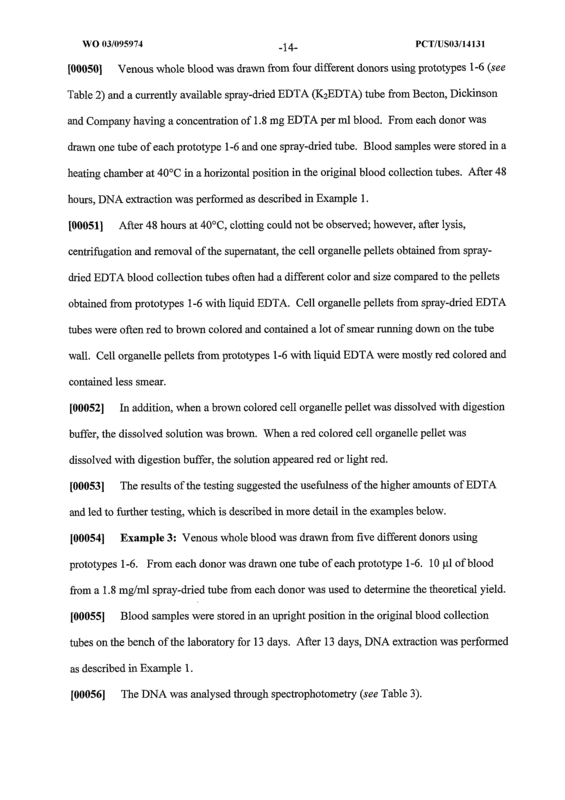 The container of claim 8, wherein the EDTA compound is spray-dried onto an inner surface of the container. 12. 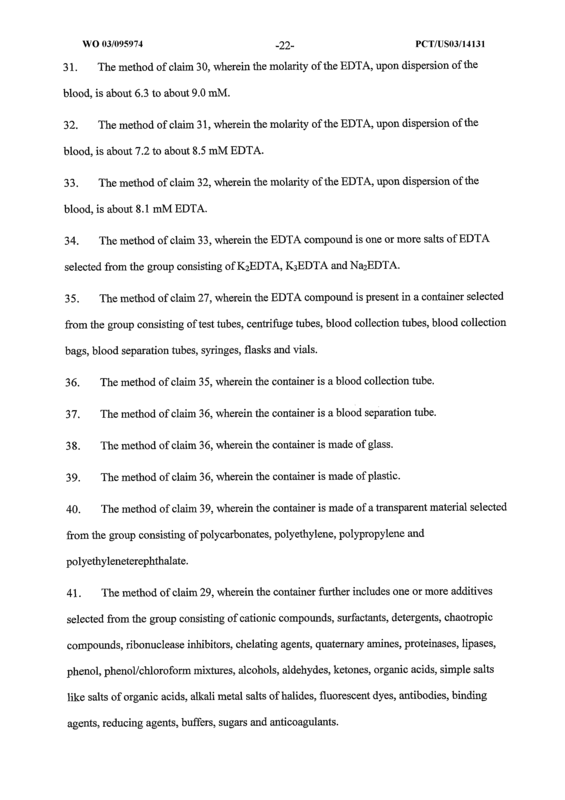 The container of claim 1 , wherein the EDTA compound is one or more salts of EDTA selected from the group consisting of K2EDTA, K3EDTA and Na2EDTA. The container of claim 1, wherein the container is selected from the group consisting of test tubes, centrifuge tubes, blood collection tubes, blood collection bags, blood separation tubes, syringes, flasks and vials. The container of claim 13, wherein the container is a blood collection tube. 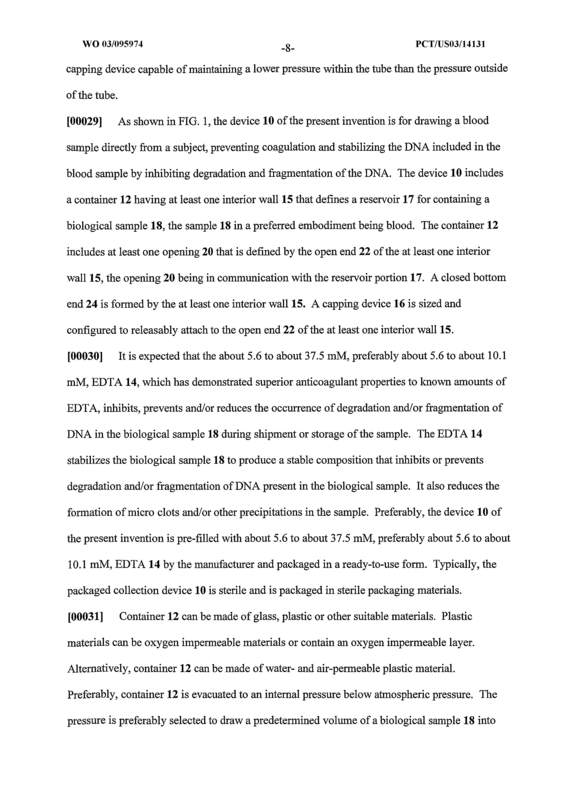 The container of claim 13, wherein the container is a blood separation tube. The container of claim 15, wherein the container comprises a gel or mechanical separator, such that upon centrifugation, the gel or mechanical separator provides separation of one or more components of the blood. The container of claim 3, wherein the container is evacuated to an internal pressure below atmospheric pressure. 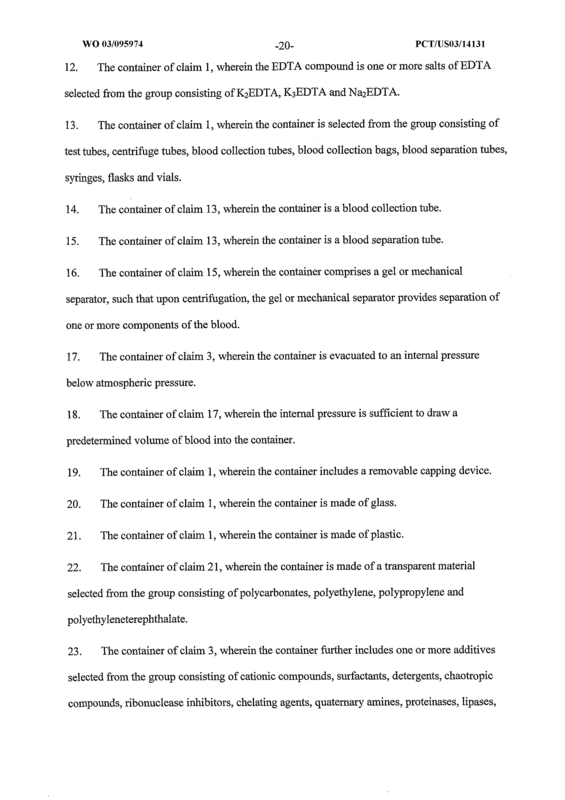 The container of claim 17, wherein the internal pressure is sufficient to draw a predetermined volume of blood into the container. 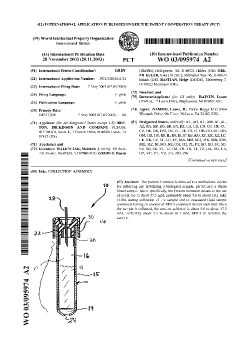 The container of claim 1, wherein the container includes a removable capping device. The container of claim 1 , wherein the container is made of glass. The container of claim 1 , wherein the container is made of plastic. The container of claim 21 , wherein the container is made of a transparent material selected from the group consisting of polycarbonates, polyethylene, polypropylene and polyethyleneterephthalate. The container of claim 3, wherein the container further includes one or more additives selected from the group consisting of cationic compounds, surfactants, detergents, chaotropic compounds, ribonuclease inhibitors, chelating agents, quaternary amines, proteinases, Upases, phenol, phenol/chloroform mixtures, alcohols, aldehydes, ketones, organic acids, simple salts like salts of organic acids, alkali metal salts of halides, fluorescent dyes, antibodies, binding agents, reducing agents, buffers, sugars and anticoagulants. A container for collecting whole blood, the container having disposed therein an amount of an EDTA compound in liquid form, wherein upon collection of the whole blood, a molarity of about 5.6 to about 10.1 mM EDTA is achieved. A container for collecting whole blood, the container having disposed therein an amount of an EDTA compound spray-dried onto an inner surface of the container, wherein upon collection of the whole blood, a molarity of about 5.6 to about 10.1 mM EDTA is achieved. 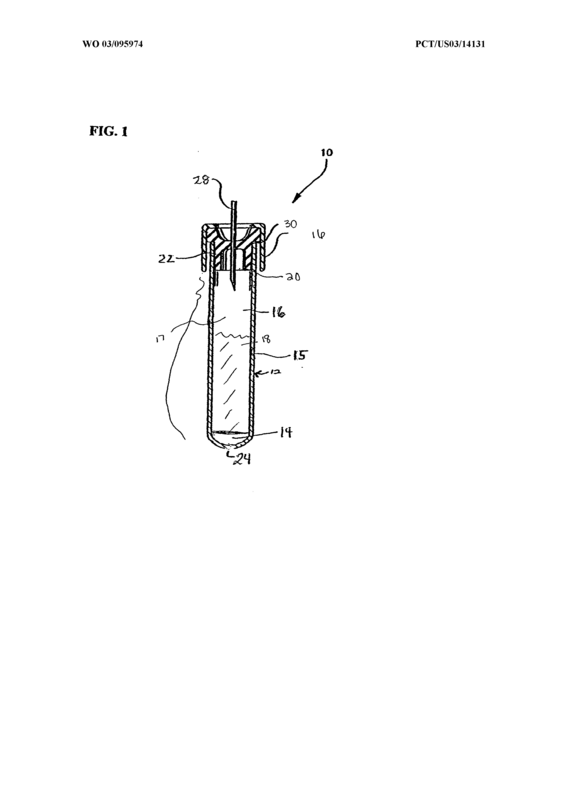 A blood separation tube for collecting whole blood, the tube having disposed therein a gel or mechanical separator, such that upon centrifugation the gel or mechanical separator provides separation of one or more components the blood, and an amount of an EDTA compound, wherein upon collection of the whole blood, a molarity of about 5.6 to about 10.1 mM EDTA is achieved. 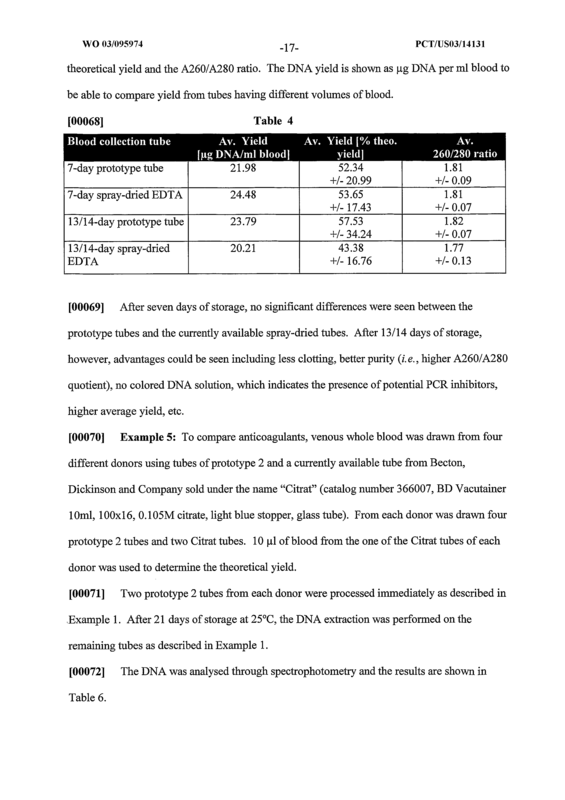 A method for stabilizing a biological fluid sample, comprising dispersing the sample in an amount of EDTA compound, wherein upon dispersion of the biological sample, about 5.6 to about 37.5 mM EDTA is achieved. The method of claim 27, wherein the sample is selected from the group consisting of whole blood, red blood cell concentrates, plasma, serum, urine, bone marrow aspirates, cerebral spinal fluid, tissue cells and other body fluids. 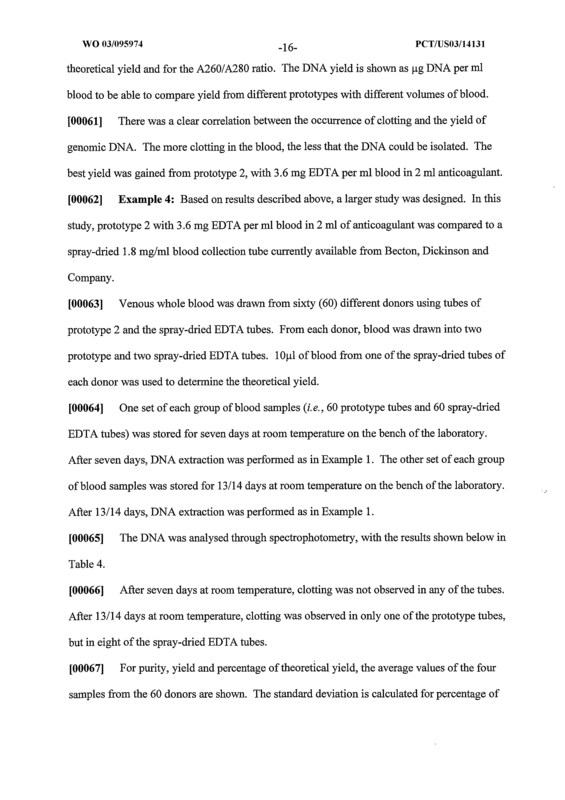 The method of claim 27, wherein the sample is whole blood. The method of claim 29, wherein the molarity of the EDTA, upon dispersion of the blood, is about 5.6 to about 10.1 mM. The method of claim 30, wherein the molarity of the EDTA, upon dispersion of the blood, is about 6.3 to about 9.0 mM. The method of claim 31 , wherein the molarity of the EDTA, upon dispersion of the blood, is about 7.2 to about 8.5 mM EDTA. 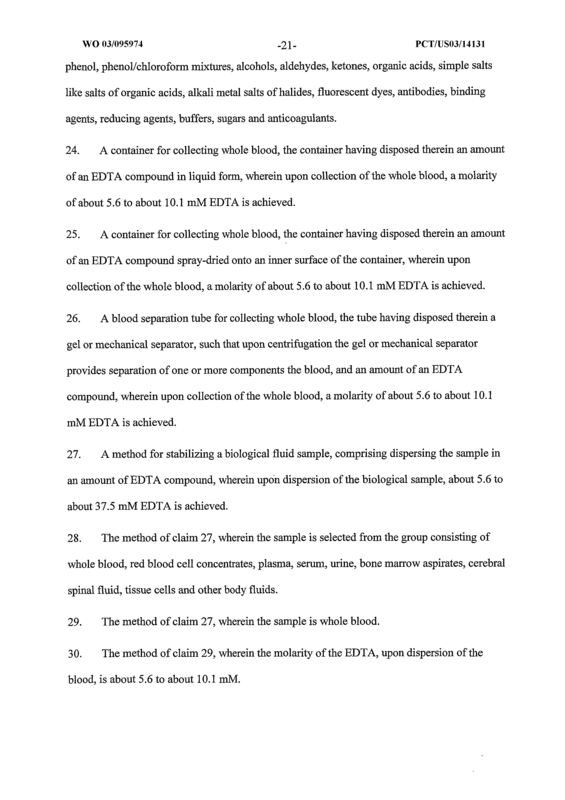 The method of claim 32, wherein the molarity of the EDTA, upon dispersion of the blood, is about 8.1 mM EDTA. 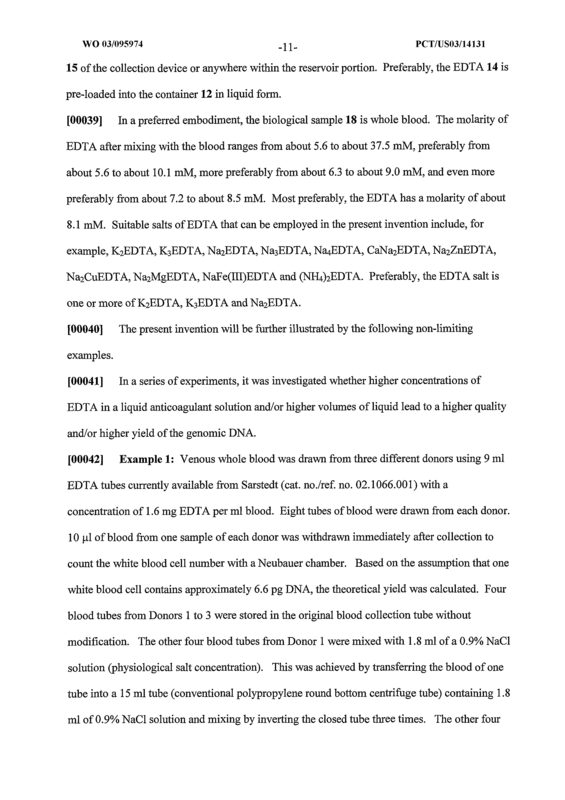 The method of claim 33, wherein the EDTA compound is one or more salts of EDTA selected from the group consisting of K2EDTA, K3EDTA and Na2EDTA. The method of claim 27, wherein the EDTA compound is present in a container selected from the group consisting of test tubes, centrifuge tubes, blood collection tubes, blood collection bags, blood separation tubes, syringes, flasks and vials. The method of claim 35, wherein the container is a blood collection tube. The method of claim 36, wherein the container is a blood separation tube. 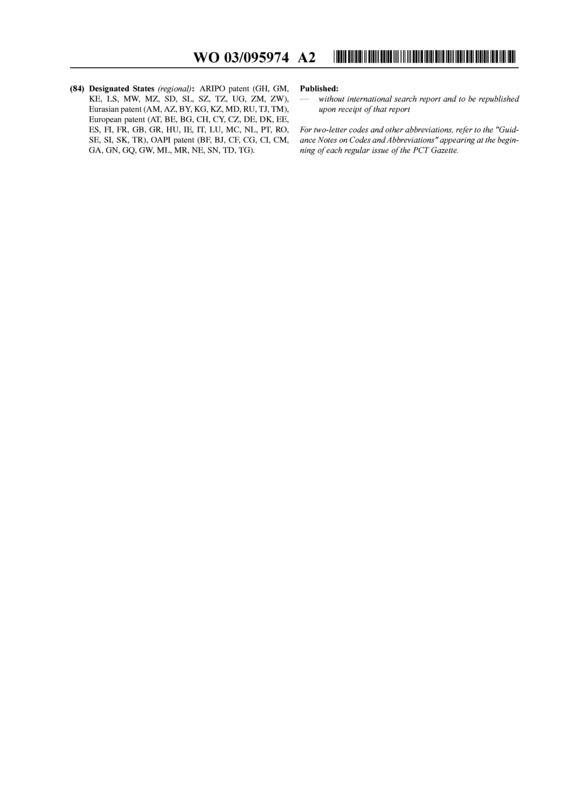 The method of claim 36, wherein the container is made of glass. The method of claim 36, wherein the container is made of plastic. The method of claim 39, wherein the container is made of a transparent material selected from the group consisting of polycarbonates, polyethylene, polypropylene and polyethyleneterephthalate. The method of claim 29, wherein the container further includes one or more additives selected from the group consisting of cationic compounds, surfactants, detergents, chaotropic compounds, ribonuclease inhibitors, chelating agents, quaternary amines, proteinases, Upases, phenol, phenol/chloroform mixtures, alcohols, aldehydes, ketones, organic acids, simple salts like salts of organic acids, alkali metal salts of halides, fluorescent dyes, antibodies, binding agents, reducing agents, buffers, sugars and anticoagulants. The method of claim 29, wherein the container is evacuated to an internal pressure below atmospheric pressure. The method of claim 42, wherein the internal pressure is sufficient to draw a predetermined volume of blood into the container. The method of claim 43, wherein the dispersing comprises directing blood from a patient into the container. 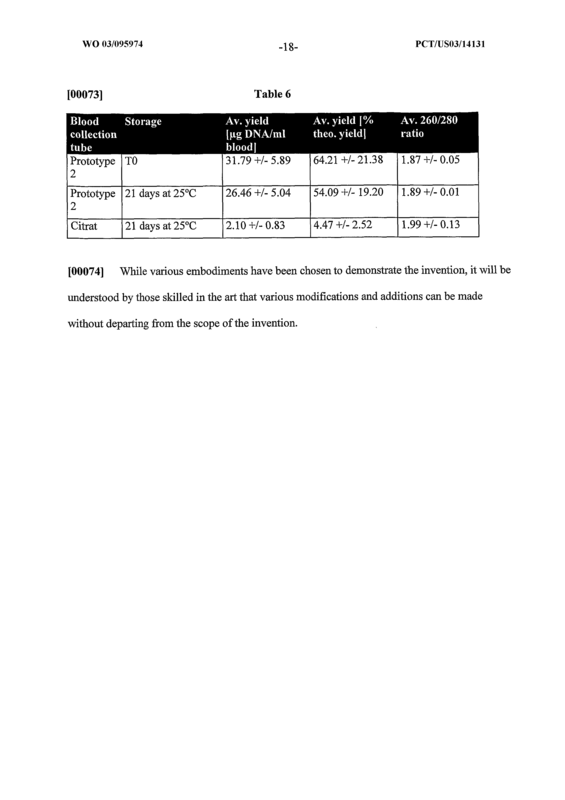 The method of claim 45, wherein the sample is selected from the group consisting of whole blood and red blood cell concentrates. 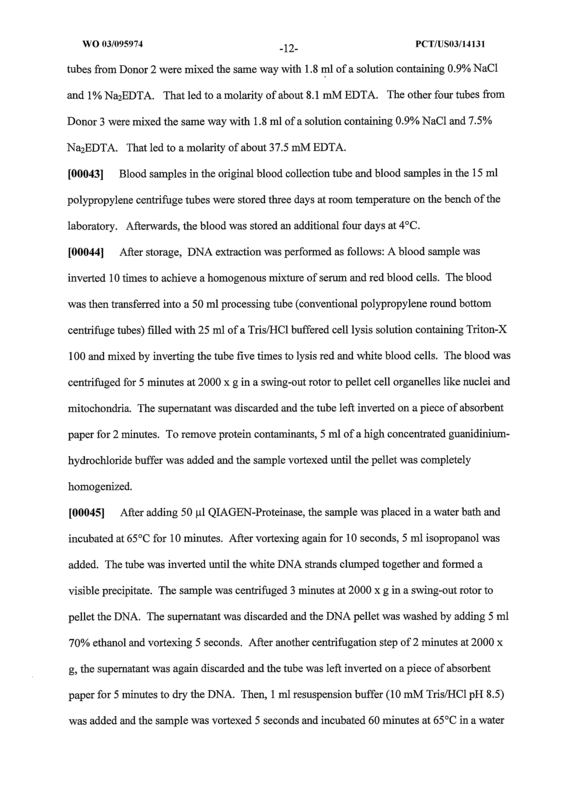 The method of claim 45, wherein the sample is whole blood. 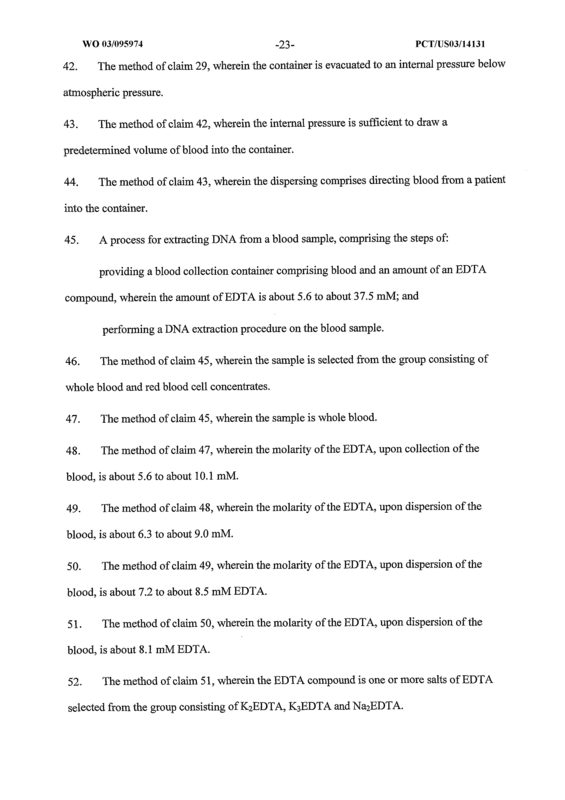 The method of claim 47, wherein the molarity of the EDTA, upon collection of the blood, is about 5.6 to about 10.1 mM. The method of claim 48, wherein the molarity of the EDTA, upon dispersion of the blood, is about 6.3 to about 9.0 mM. The method of claim 49, wherein the molarity of the EDTA, upon dispersion of the blood, is about 7.2 to about 8.5 mM EDTA. The method of claim 50, wherein the molarity of the EDTA, upon dispersion of the blood, is about 8.1 mM EDTA. 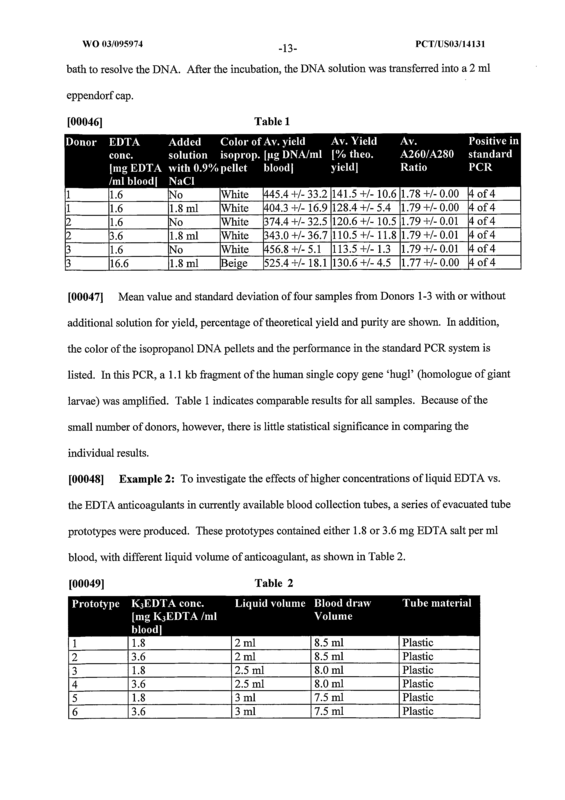 The method of claim 51 , wherein the EDTA compound is one or more salts of EDTA selected from the group consisting of K2EDTA, K3EDTA and Na2EDTA. The method of claim 45, wherein the EDTA compound is present in a container selected from the group consisting of test tubes, centrifuge tubes, blood collection tubes, blood collection bags, blood separation tubes, syringes, flasks and vials. 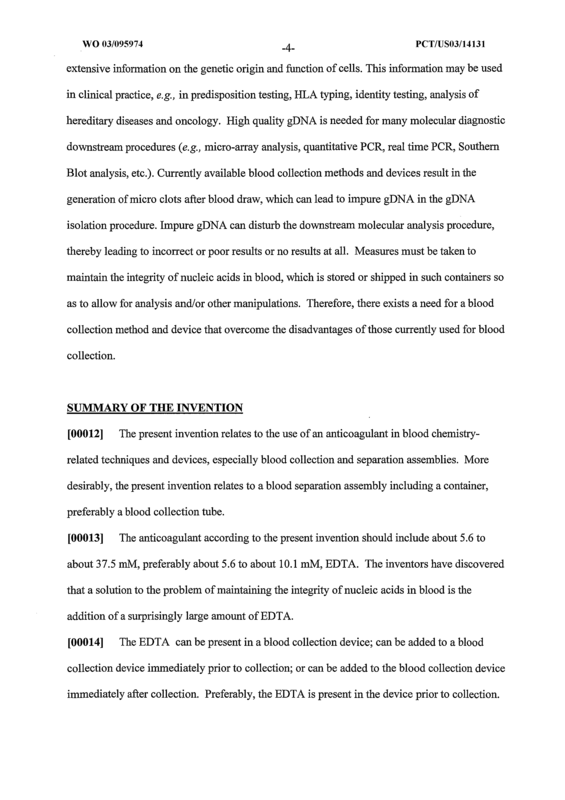 The method of claim 53, wherein the container is a blood collection tube. 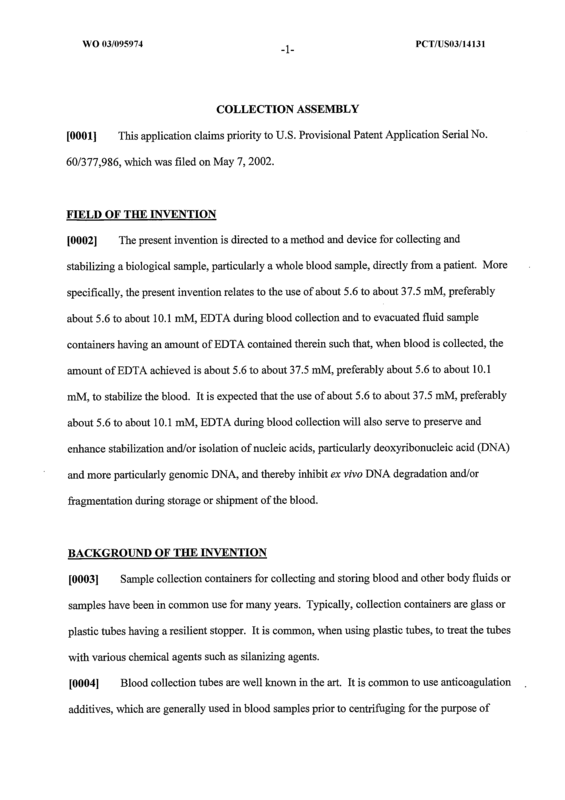 The method of claim 54, wherein the container is a blood separation tube. The method of claim 54, wherein the container is made of glass. The method of claim 54, wherein the container is made of plastic. The method of claim 57, wherein the container is made of a transparent material selected from the group consisting of polycarbonates, polyethylene, polypropylene and polyethyleneterephthalate. 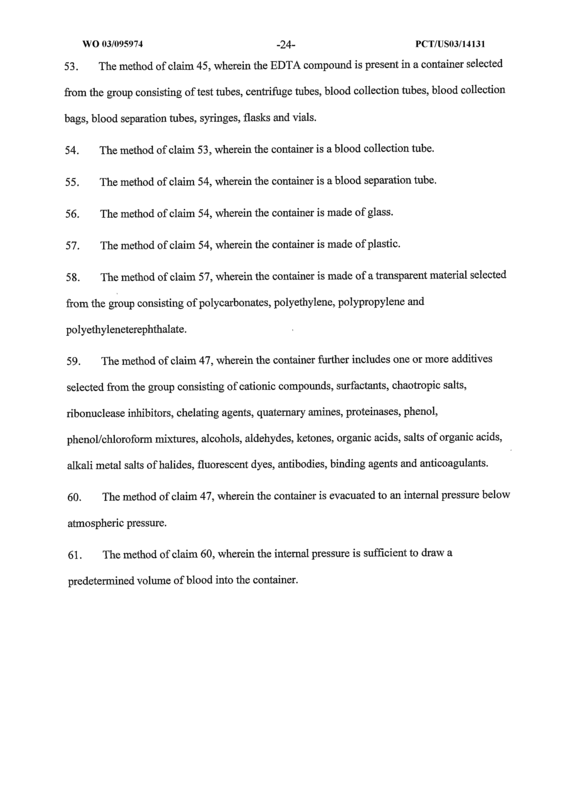 The method of claim 47, wherein the container further includes one or more additives selected from the group consisting of cationic compounds, surfactants, chaotropic salts, ribonuclease inhibitors, chelating agents, quaternary amines, proteinases, phenol, phenol/chloroform mixtures, alcohols, aldehydes, ketones, organic acids, salts of organic acids, alkali metal salts of halides, fluorescent dyes, antibodies, binding agents and anticoagulants. The method of claim 47, wherein the container is evacuated to an internal pressure below atmospheric pressure. The method of claim 60, wherein the internal pressure is sufficient to draw a predetermined volume of blood into the container.